and a balanced life that you love? You feel like your financial instability is preventing you from having the business or living the life you truly want? You are tired of the money roller coaster and the peaks and valleys you experience with your revenue? You are full of creative ideas, but missing a clear plan to generate consistent business income right now? Your marketing efforts are hit or miss, and you are not consistently attracting the right clients who will pay you what you’re worth? You are feeling the stress of up-and-down income cycles but aren’t sure how to break the cycle? You want to achieve a new level of success in your business or career, but something always seems to be preventing you from making significant progress toward your goals? 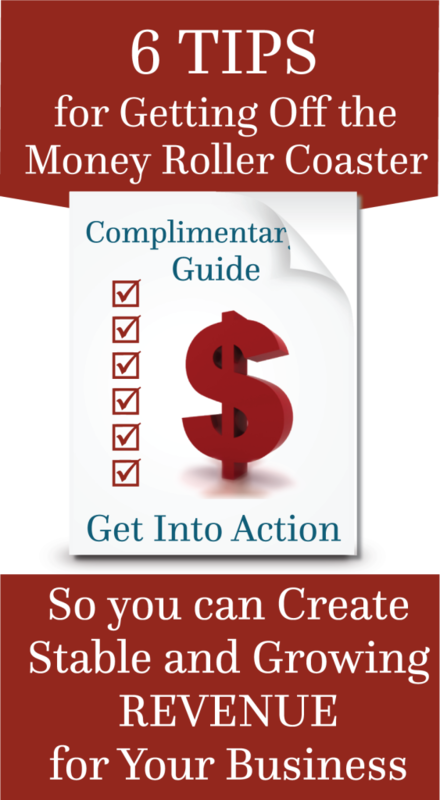 Click Access My Gift on the right side of this page to receive your Complimentary Guide – 6 Tips for Getting Off the Money Roller Coaster. It’s Time to Take Empowered Action and Create a Life that You Love! It’s Time to Take Empowered Action and Create a Business and a Life that You Love! Are you ready to be brave, be bold, be courageous and create a business and life that you love? I love the breakthrough work I do with my clients integrating practical strategies for financial success with personal growth. If you are looking to breakthrough your financial glass ceiling I would be honored to support you in your growth and transformation. I believe that all things are possible, and that we really can have it all – great relationships, careers and businesses that we love, financial abundance, hobbies and interests that we are passionate about, and the time and money to pursue them.